Keeping roads in a good condition is vital to safe driving. To monitor the degradation of road conditions is one of the important component in transportation maintenance which is labor intensive and requires domain expertise. Automatic detection of road damage is an important task in transportation maintenance for driving safety assurance. The intensity of damage and complexity of the background, makes this process a challenging task. A deep-learning based methodology for damage detection is proposed in this project after being inspired by recent success on applying Deep- learning in Computer Sciences. 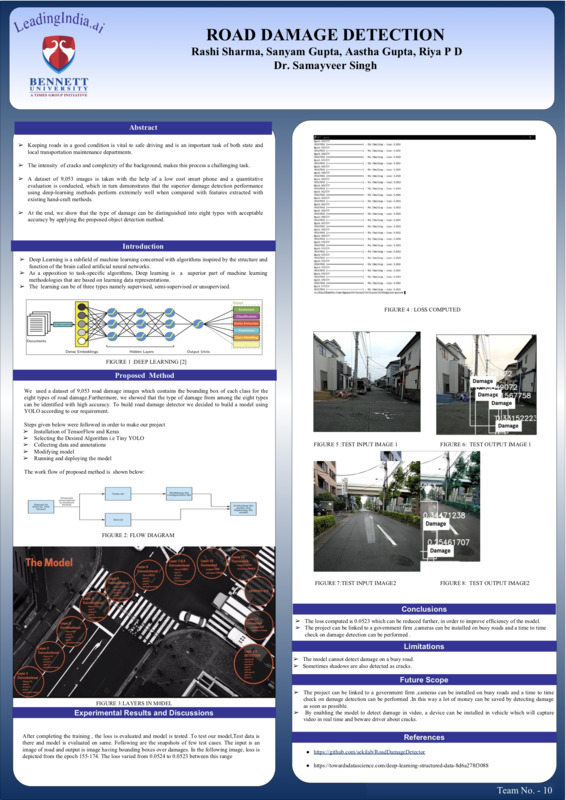 A dataset of 9,053 images is taken with the help of a low cost smart phone and a quantitative evaluation is conducted, which in turn demonstrates that the superior damage detection performance using deep-learning methods perform extremely well when compared with features extracted with existing hand-craft methods. Using convolutional neural networks to train the damage detection model with our dataset, we use the state-of-the-art object detection method, and compute the accuracy and runtime speed on a GPU server. At the end, we show that the type of damage can be distinguished into eight types with acceptable accuracy by applying the proposed object detection method.